More and more of us are being restricted with what they eat these days. Food allergies and restrictions also limit the different flavors and recipes for our enjoyment. One of the most common restrictions is gluten-containing food. Gluten is very well known to exacerbate Celiac Disease. However, gluten can also worsen many other diseases. 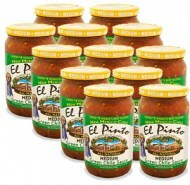 Including your favorite El Pinto green chile sauce or salsa to a gluten-free dish adds majic to the flavors you taste. El Pinto green chile sauces and salsas are not only gluten-free but they are also very nutritious which is simply perfect for the nutritional deficiencies that gluten-related conditions can cause. Did you know that every green Anaheim chile pepper, in particular, is packed full of flavor AND nutrition? In addition to being gluten free, nutritious green chile sauces and salsas are are rich in vitamins, especially vitamin A and can contain twice as much vitamin C as a single orange. A gluten-free diet does not have to be boring and sacrificing gluten does not mean sacrificing great flavor. A Green chile sauce or salsa from El Pinto made through traditional fire roasting techniques can spice-up your dish in just the degree you need. The dish will not only be safe for individuals with Celiac Disease and gluten sensitivity, but the green chile can also make your dish very healthy and delicious. Ask your server about gluten-free mexican food we serve the next time you visit our restaurant or enjoy one of our gluten free salsas right in your own home with your next meal.